Create Your Own Travel Mug and Reduce Landfill Waste! Lately I’ve been trying to avoid putting food in plastic containers. Sure, some plastics are BPA-free these days, but what other nasty chemicals might be in plastic? Fortunately, as a potter, I can make myself all sorts of ware that I feel confident is safe to use. One of those things that is so often made of plastic is the travel mug. I don’t want to fill a plastic container with a hot acidic liquid and let it sit for hours. Even if you find a stainless steel or ceramic car cup, the lid is usually plastic. So, I gave myself an assignment; design a ceramic car cup with a ceramic lid that won’t fall off as I drive or carry it out to the car. Cut two notches from the gallery of the cup rim, exactly opposite each other (1). Next, turn the lid upside down, and, using magic water or slip, attach two small balls of clay to the base of the lid, exactly opposite each other (2). Smooth the balls on and shape them into points. Test fit the lid on the mug. You want the added balls on the lid to fit exactly into the notches on the gallery, then you need to be able to turn the lid so the balls slide under the gallery and hold the lid on if you try to lift it. Adjust the shape and position of the balls on the lid until the lid turns easily and there isn’t too much play when it’s in the locked position. The last step is to cut a notch from the rim of the lid, exactly between the clay balls (3). When the lid is on, it can be turned 90° to line up the notch in the rim with one of the notches in the gallery, allowing you to drink from the opening. When the lid is turned less than 90°, it’s locked on but the opening is covered, reducing splashing as you travel with your full mug. The lid is recessed enough to keep your nose from bumping when you drink. 1 Make two round-shaped notches opposite each other on the rim’s gallery. Smooth and refine the cut out areas. 2 Score and slip to attach two small balls opposite each other on the underside of the lid. Shape the balls into points. 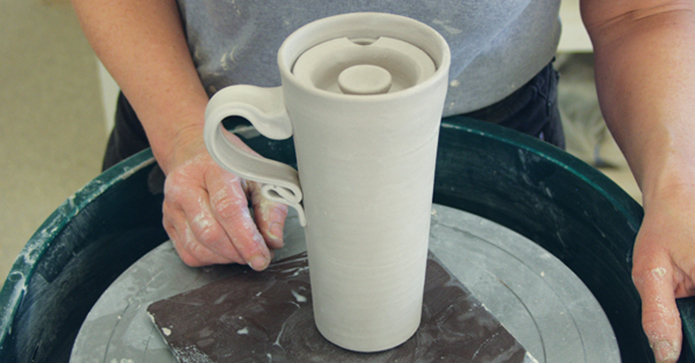 3 Carve out a notch on the rim of the lid between the added balls of clay for a drinking hole. 4 Attach a handle exactly between the notches in the gallery. Attach the bottom of the handle 7 cm above the foot.